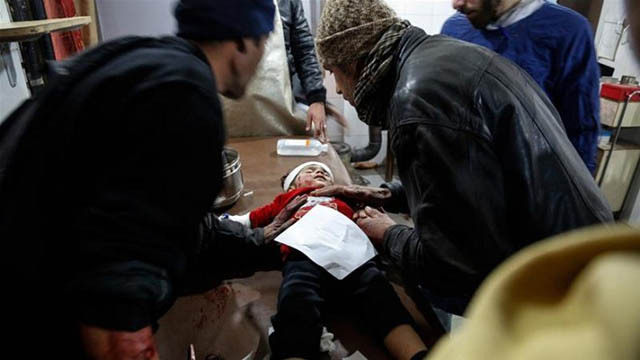 Beirut, Feb 20 (Just News): A surge in attacks by the Syrian government and its allies killed 94 people in the rebel pocket of eastern Ghouta in the space of 24 hours, a war monitoring group said on Monday. Air strikes, rocket fire and shelling on the besieged suburbs of Damascus also wounded another 325 people, the Syrian Observatory for Human Rights said. There was no comment from the Syrian military. The Damascus government says it only targets militants. Factions in Ghouta fired mortars at districts of Damascus, killing a child and wounding eight others, Syrian state media said. Troops and allied forces struck militant targets there in response, the state news agency SANA said. The United Nations says nearly 400,000 people live in eastern Ghouta, a pocket of satellite towns and farms under government siege since 2013. Panos Moumtzis, U.N. regional coordinator for the Syria crisis, said an "extreme escalation in hostilities" had killed at least 40 civilians and injured more than 150 on Monday. "The humanitarian situation of civilians in East Ghouta is spiraling out of control," he said in a statement. "Many residents have little choice but to take shelter in basements and underground bunkers with their children." The British-based Observatory said the latest escalation started on Sunday, and the dead included 18 children. The local civil defence group said warplanes and artillery had pounded Saqba, Jisreen, and other towns. The rescue service, which operates in rebel territory, said strikes killed 20 people and wounded dozens in the town of Hammouriyeh alone on Monday. Syrian President Bashar al-Assad's military gained momentum in the war after Russian war planes entered on his side in 2015, pushing rebels out of major cities, and retaking much of central and eastern Syria from Islamic State. Wael Olwan, spokesman for the Failaq al-Rahman rebel group in eastern Ghouta, said there had been heavy bombing throughout the day. "There are no ground invasions in the field and clashes, but there is very big shelling and preparatory fire," he said. The United Nations said last week Syria was seeing some of the worst fighting of the war, which is entering its eighth year. The multi-sided conflict has killed hundreds of thousands of people and driven millions from their homes. Malnutrition has increased sharply in eastern Ghouta with hardly any food aid reaching the residents, the U.N. office for humanitarian affairs (OCHA) says. Rising violence reportedly pushed some 15,000 civilians to flee their homes last month, taking refuge in makeshift shelters or basements in the enclave, OCHA said. Eastern Ghouta falls under ceasefire plans for rebel territory that Russia has brokered with the help of Turkey and Iran. Residents and aid workers say the "de-escalation" deals have brought no relief. Food, fuel, and medicine have dwindled. Russian Foreign Minister Sergei Lavrov said on Monday that Moscow and its allies could "deploy our experience of freeing Aleppo ... in the eastern Ghouta situation". With support from Russia and Iran, Damascus regained full control of the city of Aleppo in late 2016, after years of fighting and months of siege ended with an insurgent retreat. Lavrov blamed "armed provocations" by Nusra militants, formerly linked to al Qaeda, for current conditions in eastern Ghouta. The two main factions in Ghouta, which include Failaq al-Rahman, accuse Moscow and the Syrian army of breaching the de-escalation agreements. They say they have used the presence of a few hundred fighters from al Qaeda's former Syria branch as a pretext to attack the enclave.